Weather forecasting takes center stage when severe storms are predicted—storms like recent hurricanes Harvey, Irma and Maria. Unlike weather forecasting, however, predicting the consumption of commodities that can be greatly influenced by severe weather can be much more challenging and accurate. And when weather forecasters predict a land-falling hurricane—sending the populace into a frenzy—fuel carriers face their own challenge delivering the right product at the right time in the right quantities. While bulk carriers know software routinely manages delivery schedules based on daily, weekly and seasonal demand, a recent study at one fuel retailer showed the software from TMW accurately predicted demand and consumption during the hurricanes. Fueling stations are served by tank truck carriers or private fleets to meet ongoing sales demand. Those businesses use fuel management software from TMW to monitor inventory levels, submit orders and coordinate deliveries up to ten days in advance. The types and volumes of fuel to be delivered are adjusted based on sales histories and actual readings from underground storage tanks. According to John Day, Industry Principal, Energy, for TMW Systems, the objective of the software is to deliver the right quantity of commodities at the right time. “If the retailer has too much, it can’t be put in the tanks,” he said. “Or, if it’s too late (for the demand), the fuel supplier will lose money. “Most software evaluates orders,” Day said. “We look at sales history of between three and nine weeks and weigh it to figure out by type of product, portion of day, day of week or weekend, what the profile of sales looks like. Recently, the software was updated with the addition of a three-day trend monitoring capability to adjust for rapidly changing conditions—like bad weather. This revision allows the software to temporarily modify the assumptions used to forecast. The hurricanes in August and September took down 20% of the USA’s fuel-refining capacity and struck heavily populated states—Texas and Florida—plus the Commonwealth of Puerto Rico, making fuel demand swing wildly. TMW’s study ran for nearly 30 days, beginning just prior to Harvey and ending just after Irma. Based on normal demand, according to Ezzo, the fuel station was forecast to sell 11,201 gallons of regular gasoline that day. But the software picked up on the spike. Actual sales were 22,245 gallons, and the system calculated 22,295 gallons. 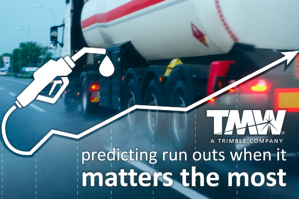 TMW’s fuel management system with three-day trend monitoring provides rapid reaction to unexpected changes in local market demand and provides accurate automated fuel-order forecasting and order generation systems. Having weathered devastating storms, the software has proven it can handle even the toughest market fluctuations that Mother Nature can dish out out. The jury, on the other hand, is still out on the latest seven-day outlook provided by your local meteorologist. Need more information for your business, contact us.